An old pool can be a real eyesore. And removing a pool can free up your landscape. We offer free estimates on our projects, so you aren’t out a dime before the project gets started. It’s just how we do business. We’ll come to your site if needed, scope out your pool removal situation, and give you a quote. We’ll schedule a demolition time that works with your schedule. We know you’re busy, and we know how loud and messy a pool demolition can be. We strive to work with our clients to tackle our projects quickly and as conveniently as possible. 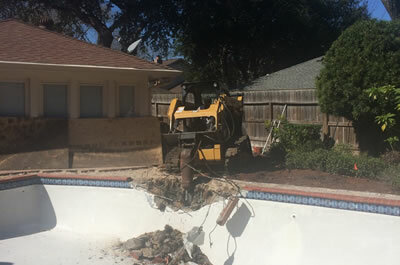 The crew will bring all the right tools and machines to take out your pool. We’ve got heavy machines and the experience to use them efficiently and safely. We have an automated jackhammer that makes demolition very quick. We’ll haul all of the scrap we pull out of the ground. We can also provide fill dirt if you’d like to level your landscape (as most of our clients do). We strive to leave your landscape as pristine as possible.